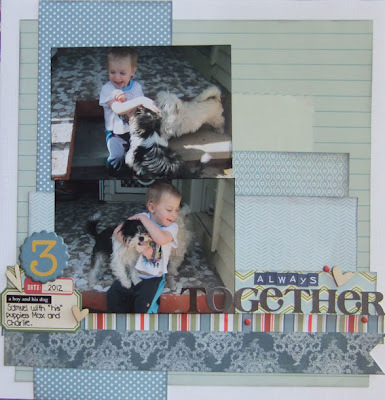 This is my second layout from Prompt 1 of Shimelle's class Scrapbook Remix. ﻿ Once again I have based my layout on Shimelle's example. Carrying on with the same papers from yesterday's post this layout is two colours (well mainly - just ignore that multicoloured stripe) - blue and green. I have "mixed in" some Echo Park For the Record, Crate Paper Storyteller, a Making Memories Note book sheet and Scenic Route (the blue and green chevron). I embellished with some October Afternoon label stickers, wood veneers from Studio Calico, red brads and a chipboard number. Not the best photos of my little man with "his puppies" but they make me laugh. Poor puppies are always getting cuddles (whether they like it or not). Ahh, I love the photos! This is so cute and so lovely! Love the mix of pp's. Wonderful job!